Add the shredded chicken, enchilada sauce, black beans, and corn to a large mixing bowl and stir to combine. Season with salt and pepper, to taste. Set aside. Grease a 9×13 casserole dish with coconut oil. Add the sweet potatoes. Then, pour the shredded chicken mixture over the sweet potatoes and top with shredded cheese. Cover tightly with aluminum foil (this is important to keep cheese from burning like mine in the picture!!). Bake for 50 minutes or until the cheese is bubbly and the sweet potatoes are cooked through. Allow the casserole to rest a few minutes before serving. *I just boil my chicken, then shred with a fork. I would be lying to say that I wasn’t a little weary of making this for my husband, as he has a weird thing with fruit. He doesn’t venture past bananas, so anytime I try to sneak fruit into a meal he snarls his nose. When I say this recipe on Martha Stewart, I was immediately drawn into the colorfulness and uniqueness of the meal. I thought, “if Martha made it, it HAS to be good.” It was! It turned out to be somewhat of a gourmet dinner. 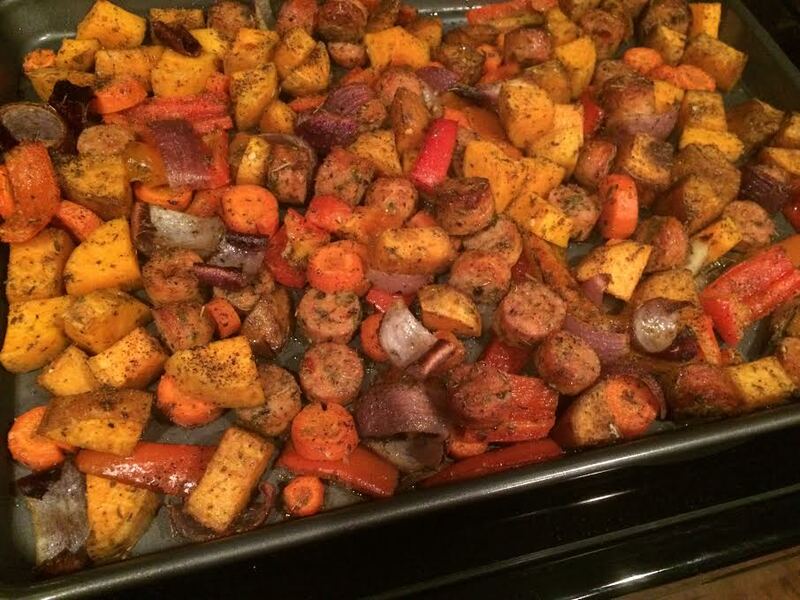 I served it alongside of mashed sweet potatoes and a mixed vegetable medley.You have to give this one a whirl! Plums aren’t a “common” fruit and are often forgotten about. However, these little guys are a force to be reckoned with! One medium-sized fresh plum contains 113 mg of potassium, a mineral that helps manage high blood pressure and reduce stroke risk. Also, plums rank low on the glycemic index, which means eating them can help you control your blood sugar and reduce the risk of type 2 diabetes making it a SAFE fruit for diabetics. Slice pork tenderloin and season with salt and pepper. Brown pork in coconut oil and butter over medium-high heat then remove from pan and set aside (leave juices in pan). In the same pan, saute plums and red onion over medium heat. Add vinegar, and stir until bubbling. Return pork to pan and toss. Voila! There are so many ways you can jazz up a boneless, skinless chicken breast. It can be one of the leanest proteins out there, but it has a tendency to get old fast. This recipe is so easy, but makes it look like you spent hours in the kitchen. So, sike your husband out and make this tonight! As a side note, this chicken calls for bread crumbs. When I pulled out my jar of store bought bread crumbs that I’ve had for quite awhile, I turned it over to read the ingredients. There was a long list of probably 100 ingredients, so I immediately said “NOPE!” to the bread crumb idea. I pulled out some organic, gluten-free crackers and crunched them up and they worked as a great alternative! Target has a new line of organic products called “Simply Balanced.” The products are affordable and tastey! 1) Preheat your oven to 350F and grease a baking pan with coconut oil or line with parchment paper. 2) In a shallow bowl, whisk egg. 3) On a flat plat, mix spices, cheese, and crumbs. 4) Dip the chicken in the egg, then roll your chicken until well coated in the spice mixture, then place chicken on baking pan. 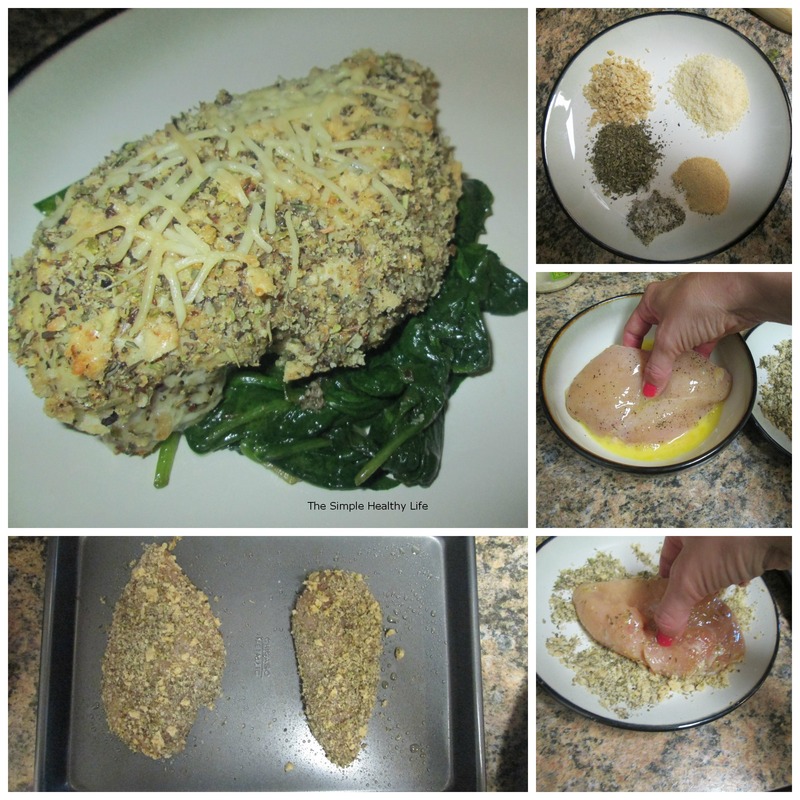 5) Bake chicken for 20-25 minutes.